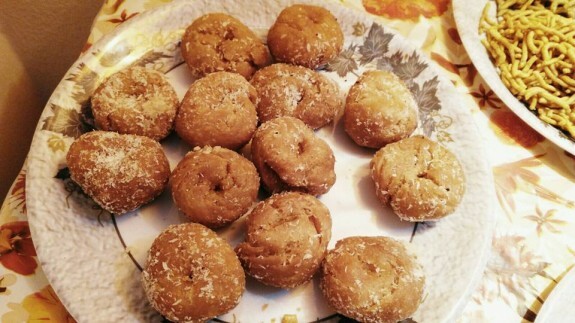 Balushahis are one of the tastiest Diwali faral recipes with sweet and full of textures and are time consuming to prepare. But it is really so tasty that after having your first bite in it will give you full of happiness that your hard work of making would become worth it.. Note: Make sure you should fry the Balushahis in low heat so that the inner part will also properly cook. 1. Add Flour and Soda Bi Carbonate in a large Bowl. Pour 4 Tbsp of ghee into it. Now, rub the flour mixture with ghee by your fingertips to give a texture like breadcrumbs. 2. Add the 6 Tbsp whisked Yogurt and knead into soft dough. You can add more or less yogurt as per the softness of the dough. Cover the dough with a moist cloth and keep it for 40 -4 5 mins. 3. Divide the dough into 12 equal portions and shape them into small balls. But take care of the dough. Make a small dent on the center of the ball with your thumb. Keep them aside. 4. Now heat sufficient ghee on the non stick pan in medium heat. Gently alight the prepared dough one by one on the ghee (maximum 2-3 at a time) and deep fry it on low heat. 5. When balushahis will start floating to the top, turn in gently and fry the other side till golden in colour. Remove with a slotted spoon and drain on kitchen tissue. Do the same process with all the balushahis and set aside to cool for 40 – 45 mins. 6. In a deep non stick pan, cook sugar with one cup water on high heat. Stir it occasionally till the sugar dissolves. Add 2 Tbsp milk on the cooking sugar syrup. Collect the scum from the side that will rises on the surface. Continue to cook till the syrup gain the required consistency. 7. Remove the syrup from heat and soak the cooled balusahis in it for 1-2 hours. 8. Gently remove the balushahis from sugar syrup and keep it on plate. Again set aside for 2-3 hours until the syrup forms a thin white layer on the balushahi.